John has been working at the practice since December 2007. In 2012, he took over the running of the practice from Ross. 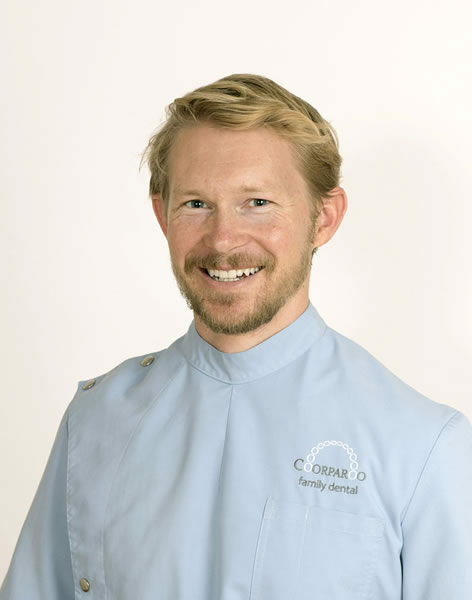 He is an involved member of Cadmus Dental Study Club, The Australian Prosthodontic Society, The Australian Endodontic Society and the Australian Dental Association Queensland Oral Health Promotion Committee. John has also taught anatomy and physiology to dental students at the University of Queensland. As a third generation dentist, John is passionate about dentistry. He feels privileged to be able to work alongside his Dad, Ross and draw upon his depth of clinical experience. Ross, John and all of the dentists regularly consult each other to ensure they always provide the best outcome for their patients. John enjoys aesthetic and conservative dentistry, and also has a keen interest in volunteer dentistry. He has spent time in Bangladesh and Nepal treating the underprivileged. John regularly volunteers as a dentist in Queensland as part of the Tzu Chi International Medical Association, treating the homeless and recently arrived refugees. Outside of work he enjoys rock climbing, surfing, cycling, crossfit, yoga and caring for his pet dogs Basil and Toby.